As I pondered this years’ garden parties, I found myself wondering how I could create even more visual interest and design detail in my garden whilst offering clever function and purpose at the same time. Strolling back to my pergola, I searched to see what new signature MARk could be added that would capture the eye and offer an element of the unexpected. Before I explain what I came up with, I must reveal my inspiration as my creativity evolves from an experience or a vision of beauty that somehow has entered my psyche and left its mark. That said, recently while in California, I fell in love with so many outdoor fireplaces and substantial fireplace mantels that were so cleverly decorated with lanterns, potted plants, and other wonderful garden elements. Some fireplaces were covered with ivy while others were made of native stone and perfectly mossed-over, their weathered look appearing as if they were inadvertently discovered a century or so ago. The weathered teak furniture was gray and beautifully situated as if to invite you to sit and enjoy this superb space. I was moved by the beauty and the functionality, knowing that I did not have room for such an oversized entertaining area. However, it got me thinking how I could bring back this concept into my own garden design. The answer was as simple as simple could be. While an outdoor fireplace was not possible, I surely could have the mantel! This was my new project for spring. I would create an outdoor mantel that was rustic, natural, and organic looking for the entertaining area under the pergola. The new mantel would offer a focal point that would capture the eyes of visitors as they wander back towards the garden studio. I began by identifying the colors and the textures that represented my inspiration: mossy native stone, historical barn wood, the prominent and historical shades of gray playing an important part of my creation. Then I began the search for some vintage corbels (brackets) that I would come to find at my favorite Westport shop “terrian”. They were perfect and I feel as if they were somehow waiting for me to pick them up. Now that I had the supports, I had to choose the shelf. I decided to use bluestone. The color of the bluestone complimented the house and the garden and added a rustic natural look to the mantel. Once I decided on the length of the shelf, which is 12 inches deep by 6 feet long, I picked a slab that was 1 å_ inches thick, as anything less would most likely break. Now that I had all the materials, I put in a call to my handyman/painter/carpenter for the installation. Because the bluestone weighed in at around 100 pounds, and I wanted to install the mantel right to the house, I felt it best to call in a professional to install it the right way the first time. This is one project you don’t want to do twice. A special heavy duty bracket was installed to the studs of the exterior of the house, followed by the corbels. He cut slight notches out of the wood siding to hide the unattractive, heavy weight-bearing brackets. The corbels fit right into the notch and the bluestone paver was then placed on top. 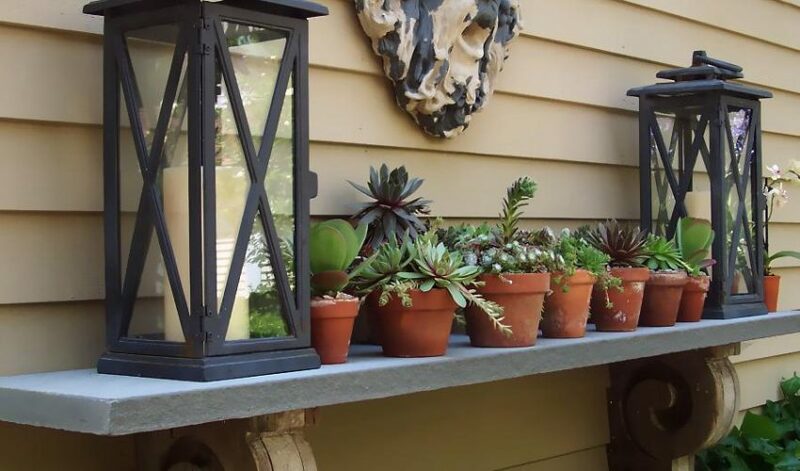 Voila, an outdoor mantel that looks like it’s always been there. Now, as I look at the finished product, I wonder how I could have lived all these years without it. It’s a perfect spot for romantic candles, potted succulents, petite orchids and decorative topiaries. I change out the lanterns with large crystal votive candle holders when I want to kick it up a notch. Nothing beats entertaining under the pergola and now my guests have something beautiful to gaze at instead of the side of my house, nice as that may be!